Turn the burner on high, toss in some chanting “ohs,” pepper in some chuggin’ guitars, and a hefty dab of that “I don’t give a damn” attitude, and that should just about do it. 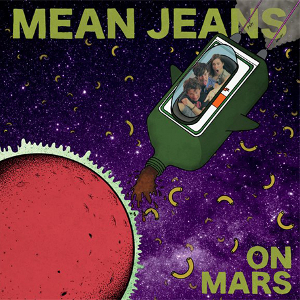 Mean Jeans‘ On Mars is served. This is the latest album by Portland root-punkers Mean Jeans. It is refreshing that someone finally figured out the time machine. This band brings the lucky listener back to when Darth Vader wore black and didn’t cruise in a podracer. It’s the late ’70s and punk is a lifestyle, not a fashion statement. On Mars possesses that welcoming 3-power chord progression that your cool uncle talks about when he used to listen to The Ramones. Vocalist Billy Jeans belts out lines about hanging on, his vexations with the world, and of course his times of partying and merrymaking. The album is a 36-minute sequence of guitar, bass, and drums that are faultlessly in sync. Mean Jeans will be playing Vitus in Oakland, CA on May 26th if you’re the kind of person who can handle the jetlag of time travel.